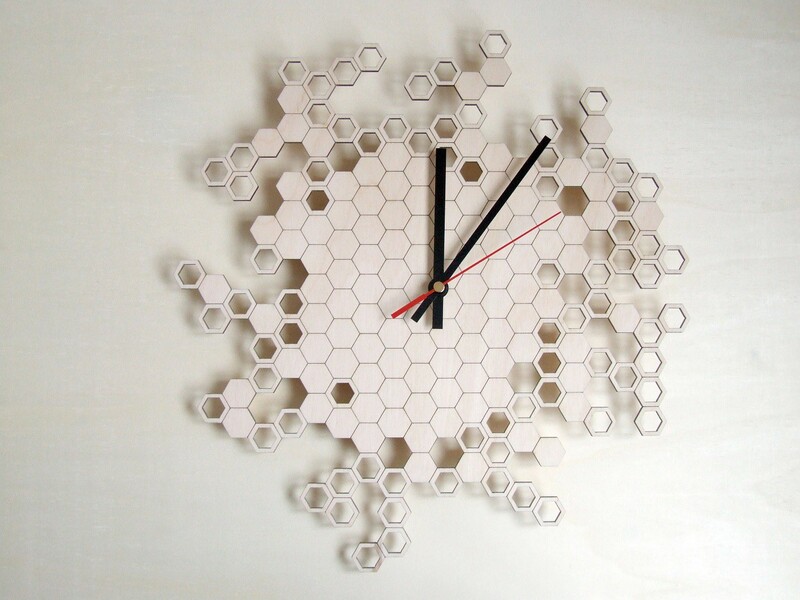 A striking wall clock with a honeycomb as inspiration. The characteristic hectagonal cells are placed in a recognizable yet surprising pattern. 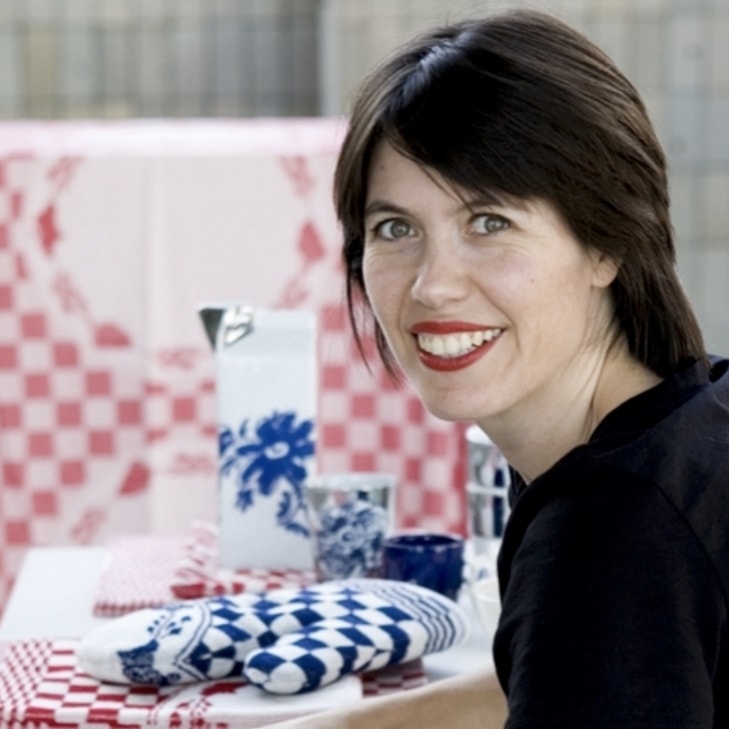 The pattern is created with ´parametric design´, where natural processes are simulated in a computer. Depth and contrast are created by the wooden, black side. 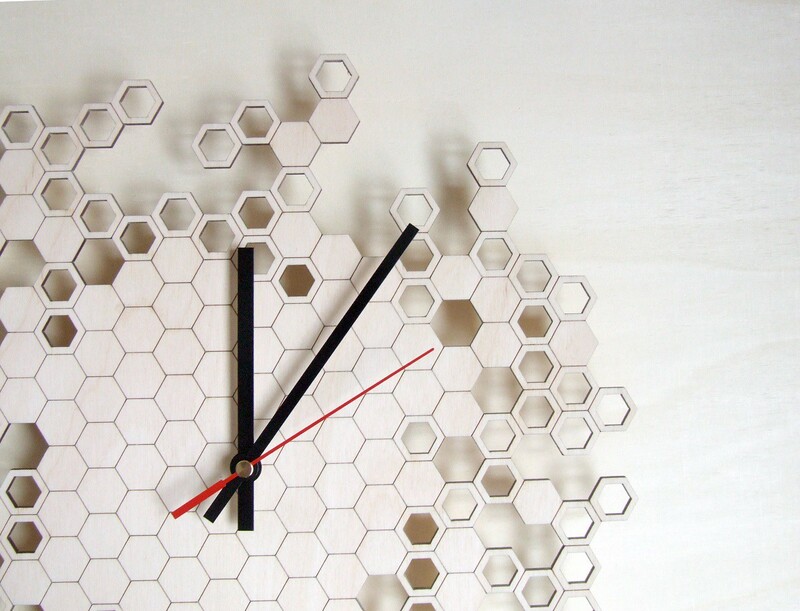 This clock was inspired by the distinctive shape of a honeycomb. The hexagonal cells have a pattern, yet are randomly placed, either filled or left empty. Depth and contrast are created by the wooden, black side. 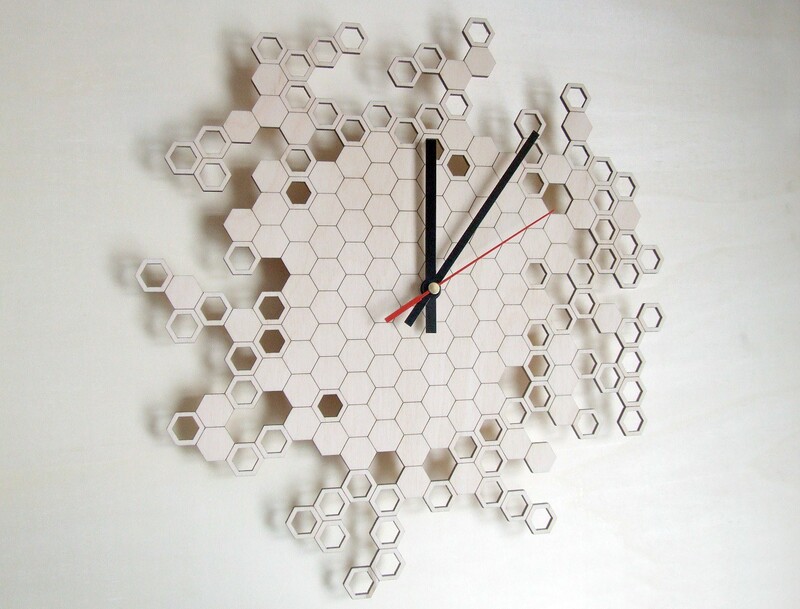 A perfect clock for everyone who loves geometrical shapes, bees, or laser-cut designs. But also if you just like the design. 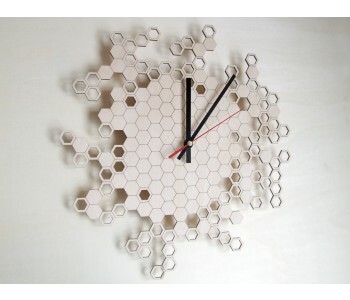 Honeycomb wall clocks are made of birch wood with a laser cutter. The front side is sanded smooth. 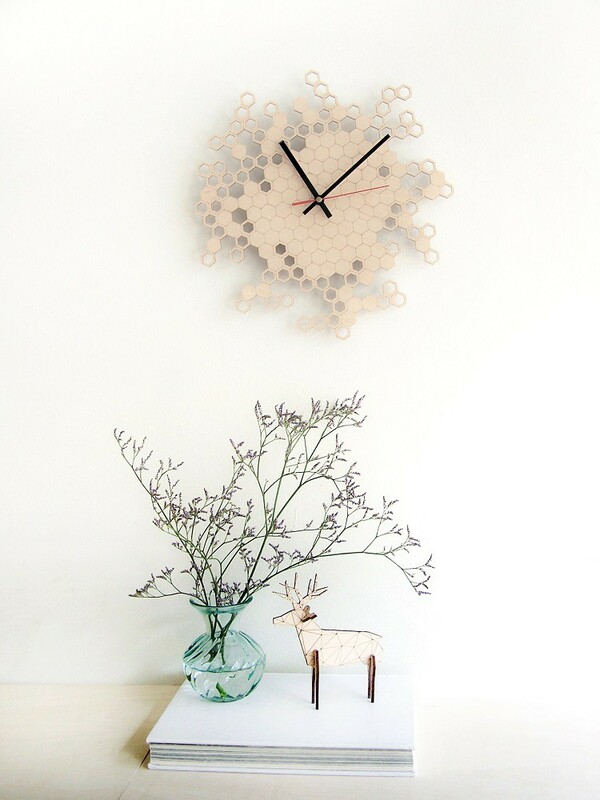 The clock has a natural birch wood color. The clock runs on a single AA battery (not included). Maybe you're wondering why bees create perfect hexagonal nests. There are two possible explanations. One theory by Jan Brozek, later proven by Thomas Hales, is that the hexagonal shape of the cells creates an efficient lay-out of the comb. This layout uses the least bees wax, but is nonetheless stable. Due to the hexagons, bees have a lot of space to store their honey and are able to save energy. Another theory, by D'Arcy Wentworth Thompson, states that the shape is simply created because of bees' specific production process of cells, somewhat similar to the patterns of mountains and bubbles. Thompson furthermore says that the queen cells (created separately) have irregular shapes without a recognizable attempt to efficiently use the comb. To protect the clock during shipment, the mechanism has not yet been installed. You can easily do this yourself by fastening the screw. Instructions are included. Don't like the ticking sound of a normal clock? Why not buy one with a silent mechanism? 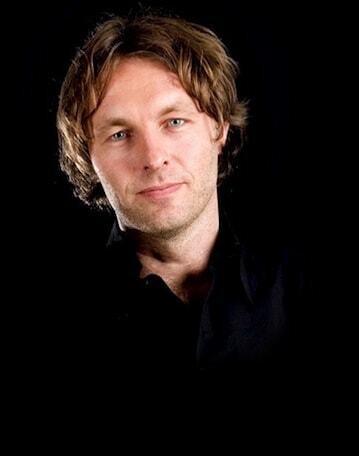 The silent clock has no ticking clock hands. However, the mechanism will still make a soft humming sound, coming from the wheels. However, this is hardly noticable.